The best way to learn is by doing. The Photographer's Playbook features photography assignments, as well as ideas, stories, and anecdotes from many of the world's most talented photographers and photography professionals. Whether you're looking for exercises to improve your craft-alone or in a group-or you're interested in learning more about the medium, this playful collection will inspire fresh ways of engaging with photographic process. Inside you will find advice for better shooting and editing, creative ways to start new projects, games and activities, and insight into the practices of those responsible for our most iconic photographs-John Baldessari, Tina Barney, Philip-Lorca diCorcia, Jim Goldberg, Miranda July, Susan Meiselas, Stephen Shore, Alec Soth, Tim Walker, and many more. The book also features a Polaroid alphabet by Mike Slack, which divides each chapter, and a handy subject guide. Edited by acclaimed photographers Jason Fulford and Gregory Halpern, the assignments and project ideas in this book are indispensable for teachers and students, and great fun for everyone fascinated by taking pictures. The Photographer s Playbook is a slap in the face for the obvious, the hackneyed, the over-familiar. 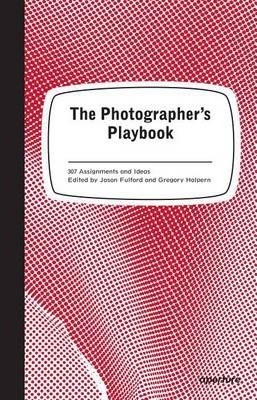 British Journal of Photography" Examines how the photograph can be animated through composition, engagement and passion; Fulford and Halpern s "The Photographer s Playbook" contains 307 assignments designed to inspire, enlighten and educate students, teachers and photographers. "British Journal of Photography"
Just what the doctor ordered for amateur photographers looking to educate themselves by immersing their imaginative gifts into the works of some of today s successful photographers. "Resource Magazine"
The idea is that photography is nothing if it stays in a little box, that there is a big wide world out there and photography needs to engage with it. "British Journal of Photography"
The Photographer s Playbook is a slap in the face for the obvious, the hackneyed, the over-familiar. "British Journal of Photography" "
Jason Fulford is a photographer and cofounder of the non-profit publisher J&L Books. He has lectured at more than a dozen art schools and universities and is a contributing editor to Blind Spot magazine. Fulford s photographs have been featured in Harper s, the New York Times Magazine, Time, Blind Spot, Aperture, and on book jackets for Don DeLillo, John Updike, Bertrand Russell, Jorge Luis Borges, Terry Eagleton, Ernest Hemingway, and Richard Ford. He is a 2014 Guggenheim fellow, and his published books include Sunbird (2000), Crushed (2003), Raising Frogs for $$$ (2006), The Mushroom Collector (2010) and Hotel Oracle (2013). Gregory Halpern received a BA in history and literature from Harvard University and an MFA from California College of the Arts. His third book of photographs, entitled A, is a photographic ramble through the streets of the American Rust Belt. His other books include Omaha Sketchbook and Harvard Works Because We Do. In 2014 he was the recipient of a Guggenheim Fellowship. He currently teaches at the Rochester Institute of Technology.